The University of Arizona, located in Tucson, Arizona, has been printing Arizona Alumni Magazine for years. But with so many people purchasing iPads and consuming their content through iPad apps and magazines, the school decided to launch Arizona Alumni iPad Magazine, with none other than mag+ platform! Utilizing the mag+ features, the magazine is very well designed and holds users’ attention with many interactive elements. The launch issue (2013 Summer) included a wonderful feature titled “10 by 10” that looked at ten alumni who have demonstrated a commitment to UA philanthropically. In that feature story, users were able to click on the image of an individual to see where he or she went after school and how that person continued to focus on philanthropy. The launch issue also featured a very cool graduation time lapse that played on the B-Layer. While the time-lapse showed the stadium filled with graduates and attendees, users could have listened to “Bear Down,” the school fight song, and browse through images of graduation on the top A-Layer. It came up as an attraction for users where they spent a lot of time exploring the page. We asked Jacob Chinn, director of photography and videography for the University of Arizona Alumni Association, why they decided to produce an iPad app and magazine. Here is what he had to say. Jacob Chinn went on to explain that the app gives UA’s readers a more immersive interactive experience. Short animated intros and sound effects allow the reader to feel more absorbed in the stories. Interactivity, such as buttons and pop-ups, help further engage readers in the content. The iPad magazine also includes extra features that cannot be found in the print edition, such as short movies, slideshows, and extended stories. This content gives UA alums a deeper and more personal understanding of what the school is doing on campus and around the world. 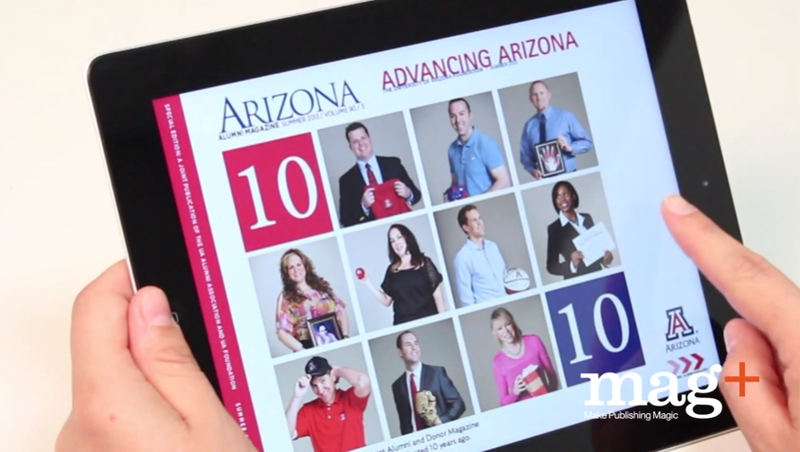 See Arizona Alumni iPad Magazine in action in this video.